There's nothing more personal than a homemade gift. I think they're especially good for those hard-to-buy-for people on your lists. Some people seem to have everything, so it can be overwhelming searching through the copious amounts of nick-nacks and gadgets that flood the store shelves during the holidays. The best homemade gift (in my opinion), is that of the food variety. It's a consumable, so it's not going to sit on a shelf and collect dust until it eventually gets donated or tossed in the garbage. Ugh...there's just so much unnecessary waste because we all have this need to buy that perfect something for people when it's actually really hard to find a gift that people actually want! I am definitely guilty of what I describe above, so I'm trying to get better at really trying to think and find out exactly what a person wants or needs. For those people who seem to have everything, today's post contains links to some super fun and creative homemade food gifts ideas, as gathered by Ellen at Family Around the Table. We all have to eat, right?! Check them all out, and maybe a few of the ideas will jump out at you as being a perfect treat for someone special to you. 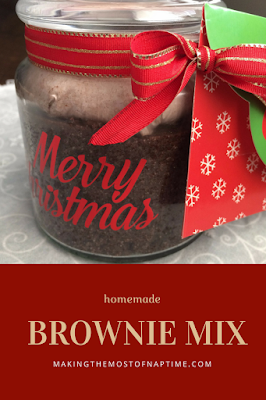 I've been working on a few homemade projects this year, including this homemade brownie mix. I tweaked a few ingredients in my usual favorite brownie recipe to make it shelf stable, and then put it in a festive jar, with a little note describing how to prepare. With this mix, you only add eggs, vanilla, and a little bit of milk, and after baking you've got perfectly soft, fudgy brownies. I've even included a little package of ingredients to mix up with milk and a bit of vanilla to glaze the top with. This will be the perfect homemade gift for any chocolate lover in your life! Mix all of the above ingredients with a pastry cutter or two forks until they resemble fine crumbs. It will look like coarse, chocolaty sugar. Place in a 2 cup capacity decorative jar (or a mason jar). Place the glaze ingredients in a zipper bag and place on top of the brownie mix ingredients. Cool for 10 minutes on a wire rack. Prepare the glaze by combining glaze mix with 1/2 tsp vanilla and approximately 2 tbsp milk. Whisk until smooth. Glaze the brownies while they are still warm. Enjoy! If you're looking for some other fantastic #FoodGifts , be sure to check out the links below! These look delicious and I love your gift presentation! Thank you for joining in the holiday food gifts event. Thank you! My "to make" list over the holidays has now gotten out of control! I can't believe the great ideas included by everyone. Food gifts for EVERYONE! This looks like the PERFECT holiday foodie gift. Can't wait to try this, Shannon. Thanks for sharing. Thanks Camilla. Brownies are a fave of mine! That's such a great gift, and it's totally pretty! Brownie Mix is always good to have on hand. What a perfect gift! I know plenty of people who would love receiving this!